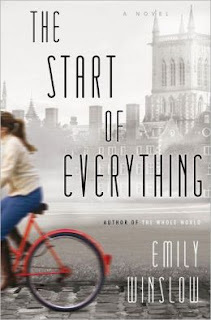 The lovely academic city of Cambridge is the setting for The Start of Everything by Emily Winslow, which starts out with the decomposed body of a young woman found washed up on some marshy land. Detective Inspector Chloe Frohmann and her partner DCI Morris Keene are put on the trail of the killer. But first they must identify the victim, which turns out to be no easy task. The book is arranged into chapters told from the point of view of one of the major characters in the book, most notably the police detectives Chloe Frohmann and Morris Keene. The relevant character's name appears at the start of each chapter, so the reader knows whose viewpoint we are experiencing. This is especially helpful in the case of the chapters following Mathilde Oliver, the daughter of a professor at the University. Although it's never stated, she obviously has some sort of disability. Perhaps it's Ausberger's, because she can't stand to be touched, seems to have no social skills, and generally behaves in odd ways. She is extremely intelligent, though, planning to attend college online and holding down a job. Her job involves trying to track down recipients of mis-directed mail for the college. In order to do this, she has to open and read the letters, to try to get some clue as to how to find the intended recipient. She becomes intrigued with a series of letters from "Stephen" to "Katja." Stephen is a writer who is desperate to meet Katja again. Eventually, one of his letters reveals that he's coming to Cambridge to see her, and gives the date and time his train is arriving. Mathilde goes to the station to try to find Stephen, even though she has no idea what he looks like. Interspersed with Mathilde's chapters are chapters following Chloe and Morris. Morris is, in rank and experience, Chloe's superior, but suddenly their roles seem to have shifted. A few months before the novel opens, Morris was questioning a suspect when the suspect suddenly pulled out a knife and attacked him. Morris was seriously injured and has only just returned to work after months of hospitalization and physical therapy. He has some lingering physical and mental difficulties which make people wonder if he's still up to doing police work. Chloe is put in the uncomfortable position of being asked to report back to their boss if she notices that Morris is having problems on the job. Add to this the fact that Chloe feels somewhat responsible for Morris's injuries, based on the fact that she wasn't with him at the time of the attack, and the reader can see that she is put into an extremely uncomfortable position. Chloe and Morris eventually attempt to tie Katja and the unidentified body to a remote manor house, which has recently been converted into apartments. The various families who live there, along with their children, nannies, and assorted visiting relatives, make reconstructing when the murder might have taken place a tricky business. At the same time, two cases of mistaken identity further help to blur the truth of what really happened, both to the murdered girl and with another case that occurred 10 years earlier. I really liked the fact that the character of Chloe was so conflicted and had so much trouble trying to figure out where her loyalties lay -- should she protect her partner, or is he a liability on the job? Should she commit to her job, or her family life? Should she protect a vulnerable witness, or press to get at the truth? There are no easy answers for her, but it's a fascinating journey watching her work through her personal and professional issues. Disclaimer: I was sent a copy of The Start of Everything by Tandem Literary in exchange for this review.